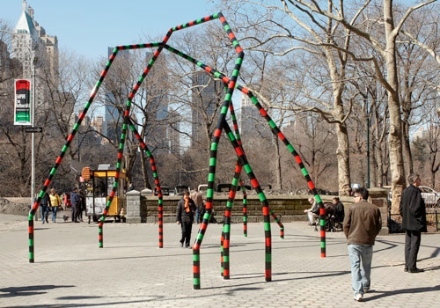 Eva Rothschild, Empire (2011). 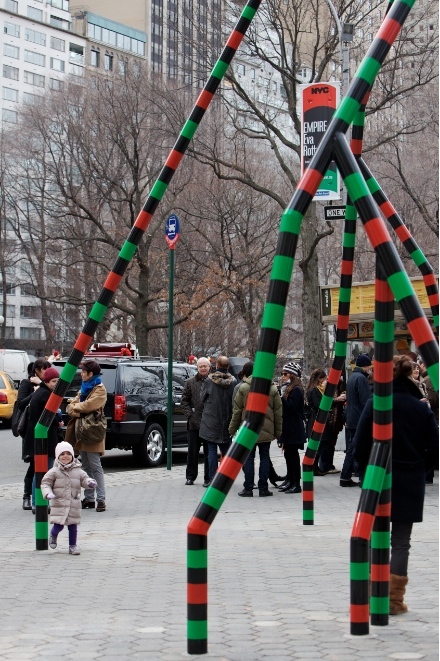 All images courtesy are via Public Art Fund. 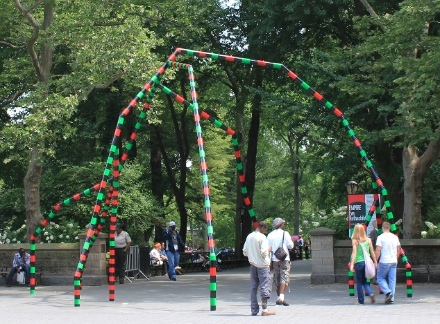 Installed at the Doris C. Freedman Plaza in Central Park, New York, “Empire” is Irish sculptor Eva Rothschild’s first commissioned public art work in the United States. Appearing at once ominous and playful, “Empire” greets pedestrians at the southeast entrance to the park. 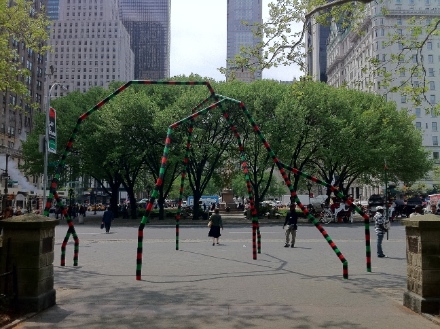 The sculpture joins the ranks of past Public Art Fund art installations that have been displayed in the plaza. Empire’s open structure and natural flow invites visitors to walk underneath and around the piece, but it also stands to function as a gate through which visitors must pass before entering the park. Its thin lines evoke tree branches, while bands of black, red and green colors seem to mimic the animal markings. The Public Art Fund notes, “Rothschild’s chosen title, Empire, resonates with the location of her new work: the heart of the “Empire State.” When compared to the more formal monuments and sculptures that Central Park is known for, Empire appears that much more interesting. If viewed from above, the piece could resemble lines on a map, marking off a certain area or charting a route for travel. One also thinks of an archway, welcoming and warning at the same time. Rothschild’s sculptures take on geometric shapes and irregular constructions, and are made from a variety of materials ranging from metal and glass to leather. Her work is known for its simple yet complex structure, and brings to mind the work of the Minimalists during the 1960’s and 70’s. Whether installed on the wall or left freestanding, her pieces deal with space and situation, and encourage the viewer to examine all angles and all possible viewpoints. Rothschild’s work is included in the collections of Carnegie Museum of Art, Pittsburgh; Irish Museum of Modern Art, Dublin; and Tate, London. “Empire” is display until August 28th. 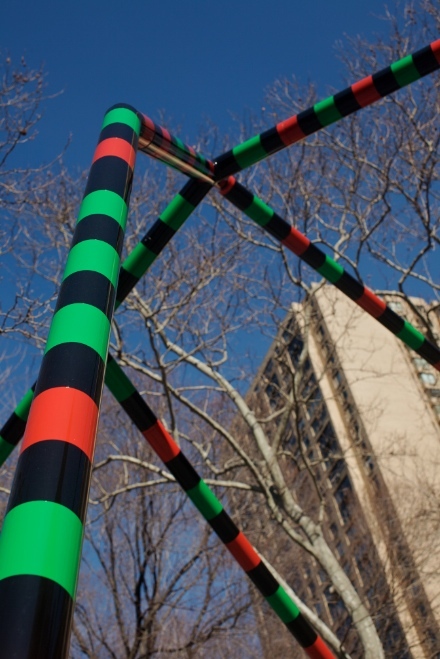 The Doris C. Freedman Plaza is named after the founder of the Public Art Fund. This entry was posted on Monday, August 15th, 2011 at 7:35 pm	and is filed under Go See. You can follow any responses to this entry through the RSS 2.0 feed. You can leave a response, or trackback from your own site. The Art Bureaucracy says it’s important, so everyone will believe it’s important. Such is the Official Art World today.